How can it comes to word this five intensive day workshops and trainings.It was such a hard work for Tony and Becci and for us to catch every singleprecious lessons . In second day we had map reading and Navigation, how to use compass and measure pacing which was great fun for everyone. In third day we had a variety of health and safety lessons that covers every day life and especial cases for us as members of craggers. 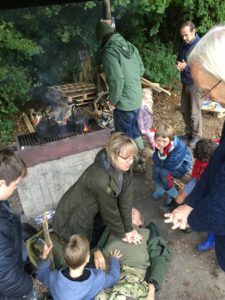 First Aid & help and save lessons that perform nicely with Becci and Tony for more than one day which included making carrier for injured with woods and three coats In special situations. In fourth day ,fire making without any artificial substance that was offered by Richard and was very existing as it let us to try making the fire for the first time with just two simple wood however most of us find it very tricky but still interesting. Making shelter in woods by Tony that was amazing . And last one and best one was making the basket with nettles . At the end I should to add a big thanks and wish best to Becci for giving us a lift and her supportiveness. Thanks a lot for Tony for all worthy and functional lessons . And thank you so much ,Richard with your passion and kindness give us a great experiences.